On the occasion of the exhibition Bacus, the masks of the god, we can see for the first time in the Museum a figurative mosaic, unique in Baetulo, which refers to the god Bacus. The mosaic, made of white and black tiles, decorated a room of a domus located on Pujol street. This house, therefore, was close to the domus of the Dolphins and Ivy. 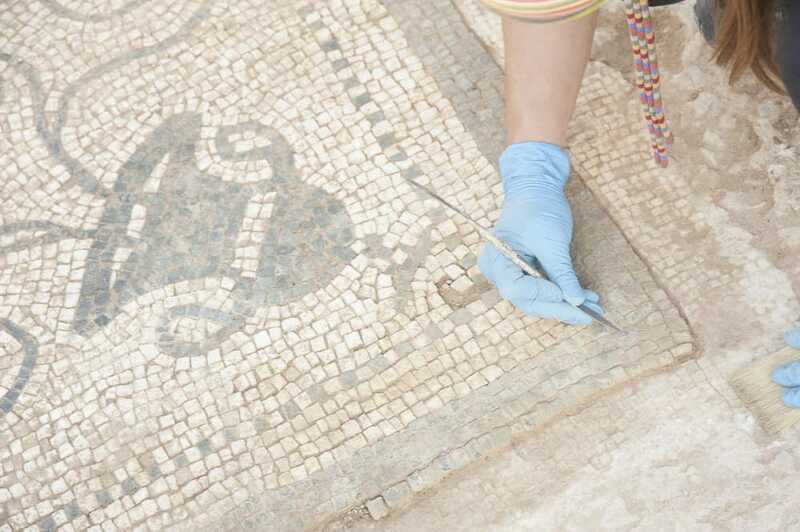 The mosaic, which is one of the outstanding pieces of the exhibition, was found in April 2018 during the second phase of an archaeological excavation that had begun in 2006 and which revealed an artisanal pottery settlement from the founding moment of the city (1st century BC) and part of a street (decumanus) with constructions on either side. The decoration of the mosaic, which has been restored, refers to Bacchus, since the elements that appear there (the goat, the panther and the craters from which vine elements appear) are part of the Roman iconography tradition linked to this divinity .